If you stand along Dakar’s coastline and gaze past the Mosque of la Divinite, the rolling waves of the Atlantic are rarely a solitary site. Scattered across the ocean are often dozens of surfers, taking advantage of being in one of Africa’s prime surfing destinations. Senegal is known to have some of the best waves in West Africa and surfers from across the world have journeyed to the coastline of the capital Dakar for decades. With the relaxed atmosphere, warm waters, and breathtaking scenery, it is not hard to understand why. While these waves are on the radar of international surfers, it is the community of local surfers who know Dakar’s tides like the back of their hands. Many have grown up by the ocean and surfing has shaped their lives since childhood. Babacar Thiaw, a Dakar local, has been surfing since he was six years old and owns the surf school Senesurf, in Dakar’s Plage de Virage. “I decided I wanted to focus on surfing and develop these activities in my country. We have such a beautiful coast and people are coming all over the world. We have some very famous waves right here,” he says. Dakar’s coast is the perfect spot for surfers of all levels. The peninsula catches the swell from both north and south, with consistent waves throughout the year. Right by Senesurf is Virage, a good site for beginners. There is also Ngor, Ouakam, and Yoff, all popular spots to find breaks. Although Senegal’s surf has caught international attention (elevated by the 1960s surf movie The Endless Summer), these waves have yet to make it into mainstream consciousness. 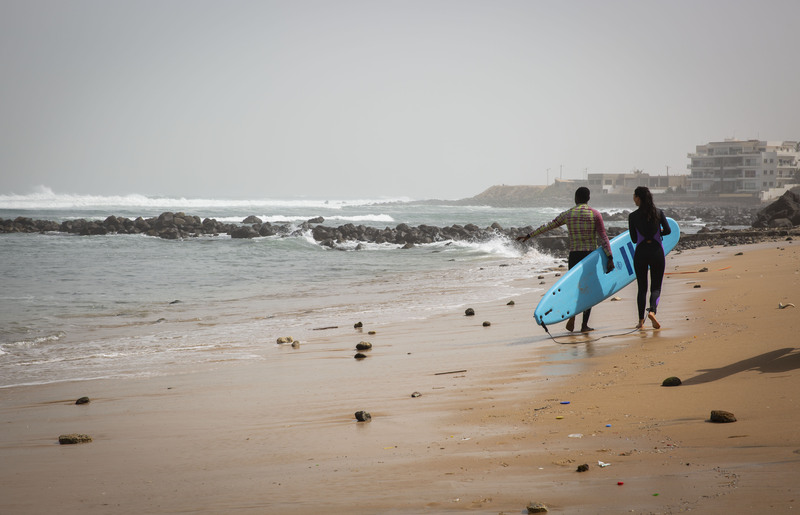 Despite inaccurate stereotypes, surfing in Dakar has continued to thrive. This is particularly noteworthy given the scarce resources among Senegal’s surf community. 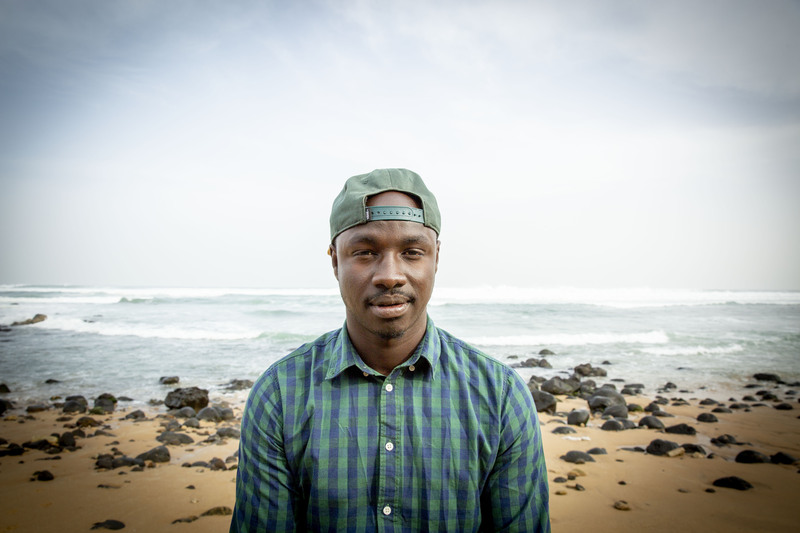 “Back in the day, we could barely count how many people were surfing,” Thiaw remembers. In fact, he was only able to get his first board by bartering with a Spanish tourist. Since then, a distinctive local surfing culture has emerged, with a mix of professionals and beginners taking to Dakar’s waves. Surf schools like Senesurf are at the forefront of this movement, with Thiaw introducing Senegal’s next generation of surfers to the sport. “I start teaching with the kids, they are the future,” he says. 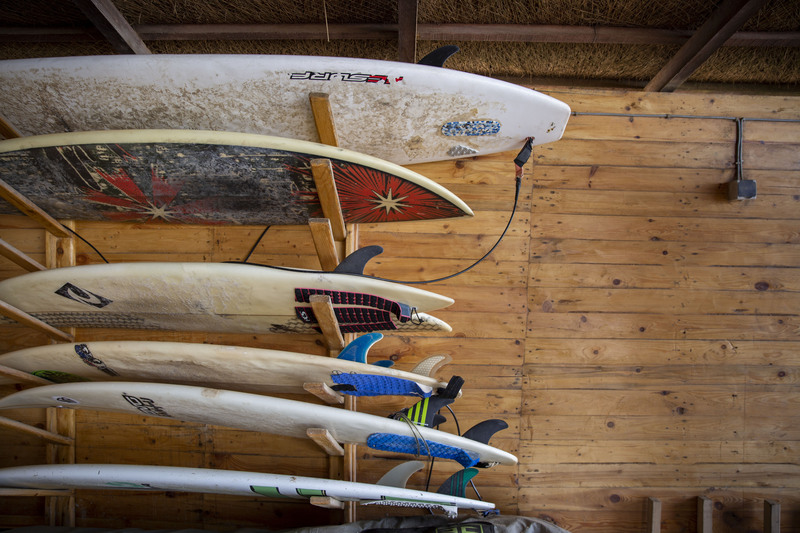 The development of local surfing can also be seen in the example of Senesurf itself, which emphasises its distinction as a school owned entirely by Senegalese locals. The surfing industry has not escaped the high number of foreign investors in Senegal, making Senesurf largely unique. 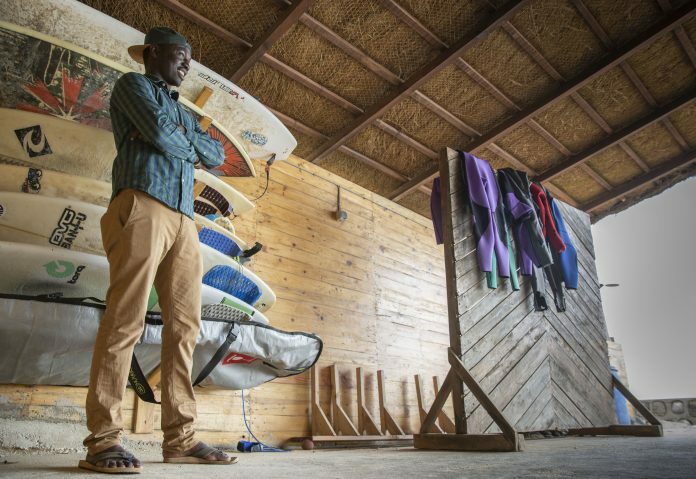 “We need more Senegalese involved in surfing and making it their own business,” said Thiaw. With this in mind, Thiaw and others in the surfing community are currently working on shaping their own boards. The aim is to avoid the expensive import prices of surfing materials and allow for greater access to Dakar’s waves, for locals and foreigners alike. In March, the World Surfers League (WSL) championship takes place in Dakar, the first in West Africa since the WSL’s creation in 1976. And along with the perfect waves and dynamic energy of Senegal’s surfing community, it seems like the sport is gathering continuous momentum in Dakar.